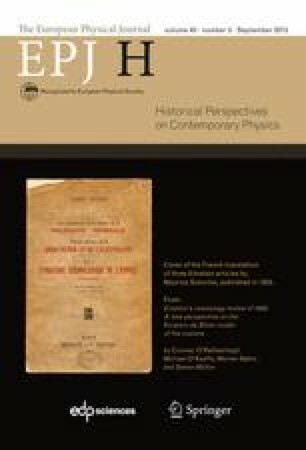 In this article Denis Diderot’s Fifth Memoir of 1748 on the problem of a pendulum damped by air resistance is discussed in its historical as well as mathematical aspects. Diderot wrote the Memoir in order to clarify an assumption Newton made without further justification in the first pages of the Principia in connection with an experiment to verify the Third Law of Motion using colliding pendulums. To explain the differences between experimental and theoretical values, Newton assumed the bob was traversed. By giving Newton’s arguments a mathematical scaffolding and recasting his geometrical reasoning in the language of differential calculus, Diderot provided a step-by-step solution guide to the problem. He also showed that Newton’s assumption was equivalent to having assumed F R proportional the bob’s velocity v, when in fact he believed it should be replaced by F R ∼ v 2. His solution is presented in full detail and his results are compared to those obtained from a Lindstedt-Poincaré approximation for an oscillator with quadratic damping. It is shown that, up to a prefactor, both results coincide. Some results that follow from his approach are presented and discussed for the first time. Experimental evidence to support Diderot’s or Newton’s claims is discussed together with the limitations of their solutions. Some misprints in the original memoir are pointed out. Supplementary material is available for this article at 10.1140/epjh/e2015-50054-8 and is accessible for authorized users.